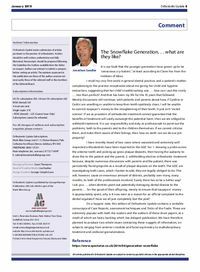 Orthodontic Update: Issue - Article: The Snowflake Generation. . . what are they like? Editorial Comment: The Snowflake Generation. . . what are they like? Abstract: It is our fault that the younger generation have grown up to be ‘censorious cry-babies’,1 at least according to Claire Fox from the Institute of Ideas.